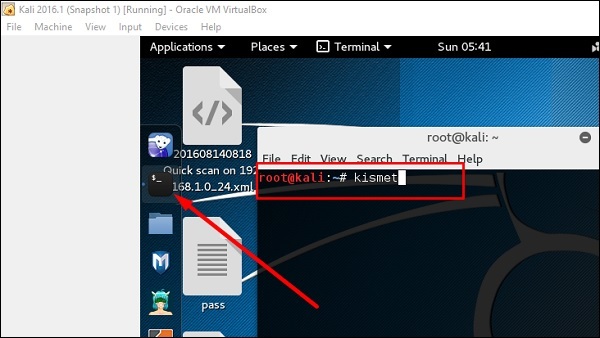 In this chapter, we will learn how to use Wi-Fi cracking tools that Kali Linux has incorporated. However, it is important that the wireless card that you has a support monitoring mode. 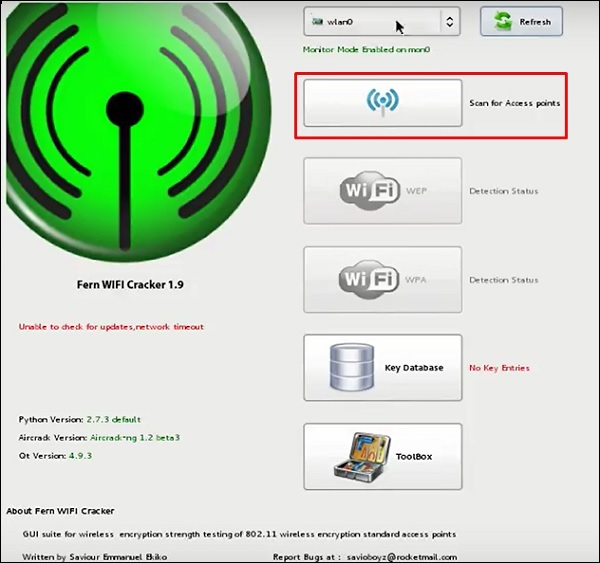 Fern Wifi cracker is one of the tools that Kali has to crack wireless. Before opening Fern, we should turn the wireless card into monitoring mode. To do this, Type “airmon-ng start wlan-0” in the terminal. Now, open Fern Wireless Cracker. 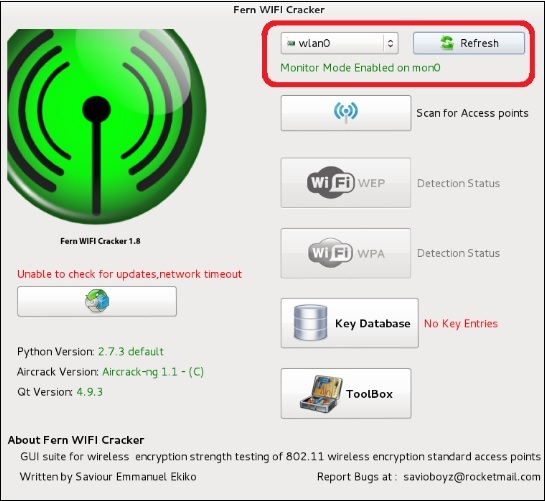 Step 1 − Applications → Click “Wireless Attacks” → “Fern Wireless Cracker”. Step 2 − Select the Wireless card as shown in the following screenshot. Step 3 − Click “Scan for Access Points”. Step 4 − After finishing the scan, it will show all the wireless networks found. In this case, only “WPA networks” was found. 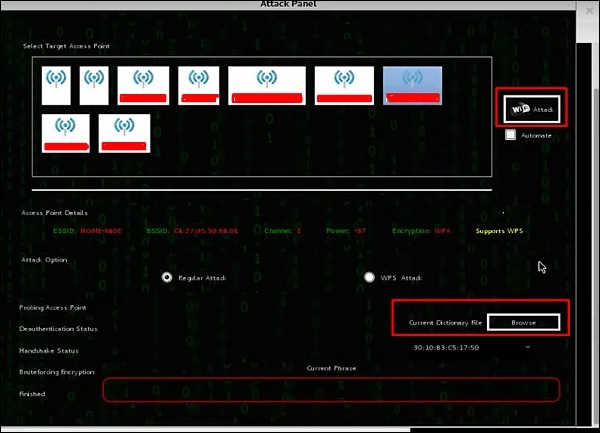 Step 5 − Click WPA networks as shown in the above screenshot. It shows all the wireless found. Generally, in WPA networks, it performs Dictionary attacks as such. Step 6 − Click “Browse” and find the wordlist to use for attack. Step 7 − Click “Wifi Attack”. Step 8 − After finishing the dictionary attack, it found the password and it will show as depicted in the following screenshot picture. 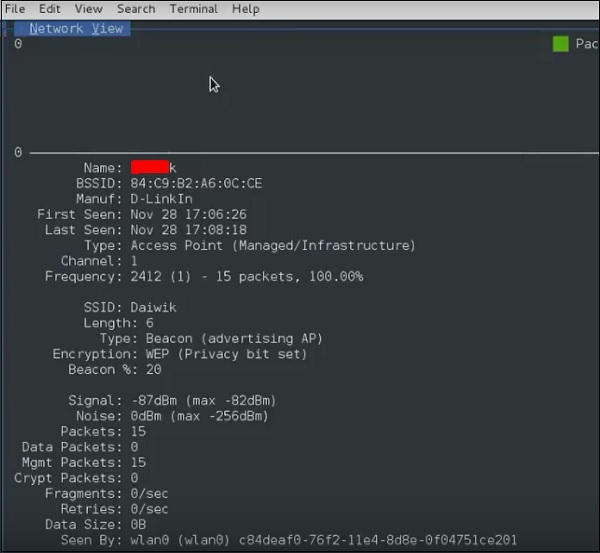 Kismet is a WIFI network analyzing tool. It is a 802.11 layer-2 wireless network detector, sniffer, and intrusion detection system. It will work with any wireless card that supports raw monitoring (rfmon) mode, and can sniff 802.11a/b/g/n traffic. It identifies the networks by collecting packets and also hidden networks. To use it, turn the wireless card into monitoring mode and to do this, type “airmon-ng start wlan-0”in the terminal. Let’s learn how to use this tool. 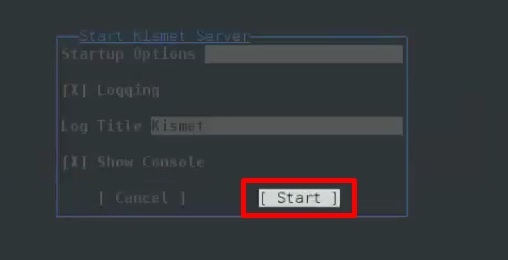 Step 1 − To launch it, open terminal and type “kismet”. Step 2 − Click “OK”. 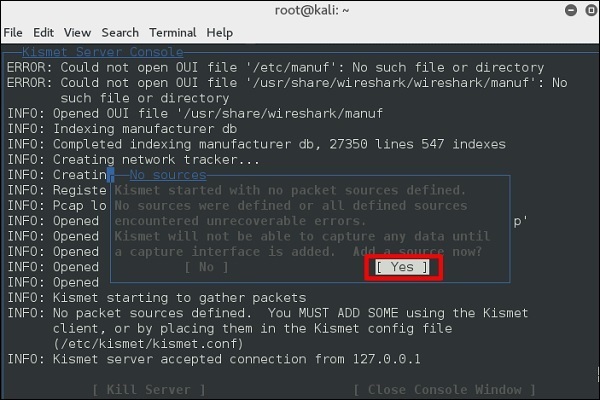 Step 3 − Click “Yes” when it asks to start Kismet Server. Otherwise it will stop functioning. Step 4 − Startup Options, leave as default. Click “Start”. Step 5 − Now it will show a table asking you to define the wireless card. In such case, click Yes. Step 6 − In this case, the wireless source is “wlan0”. It will have to be written in the section “Intf” → click “Add”. Step 7 − It will start sniffing the wifi networks as shown in the following screenshot. 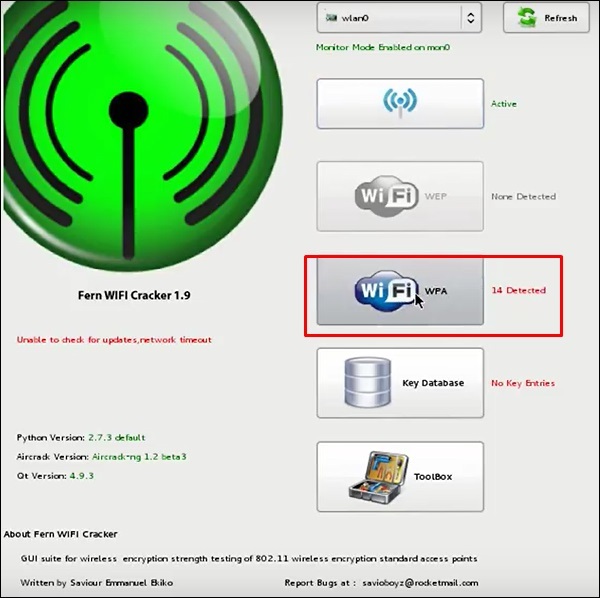 Step 8 − Click on any network, it produces the wireless details as shown in the following screenshot. GISKismet is a wireless visualization tool to represent data gathered using Kismet in a practical way. GISKismet stores the information in a database so we can query data and generate graphs using SQL. GISKismet currently uses SQLite for the database and GoogleEarth / KML files for graphing. 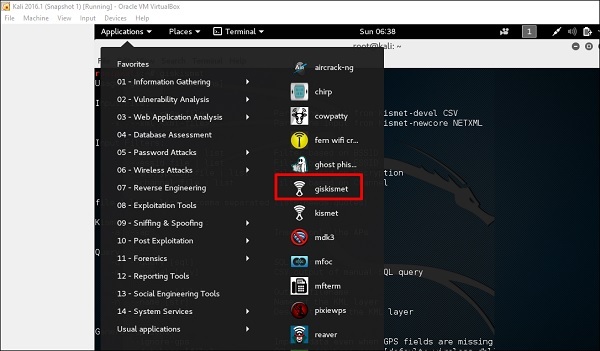 Step 1 − To open GISKismet, go to: Applications → Click “Wireless Attacks” → giskismet. 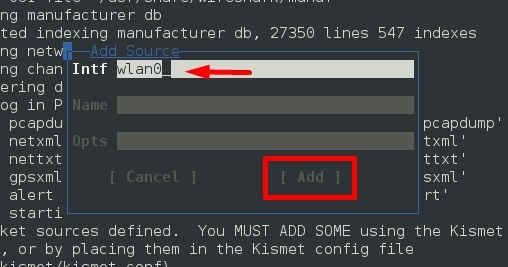 As you remember in the previous section, we used Kismet tool to explore data about wireless networks and all this data Kismet packs in netXML files. Step 2 − To import this file into Giskismet, type “root@kali:~# giskismet -x Kismetfilename.netxml” and it will start importing the files. Once imported, we can import them to Google Earth the Hotspots that we found before. 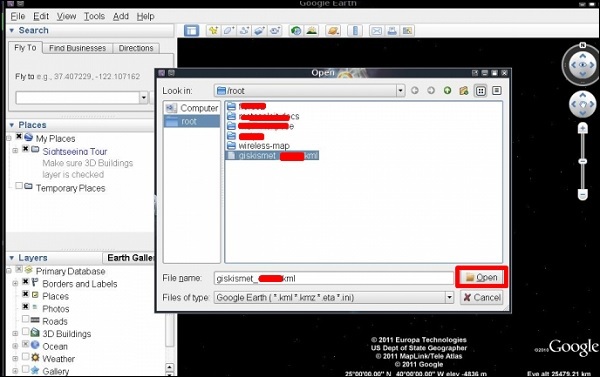 Step 3 − Assuming that we have already installed Google Earth, we click File → Open File that Giskismet created → Click “Open”. The following map will be displayed. 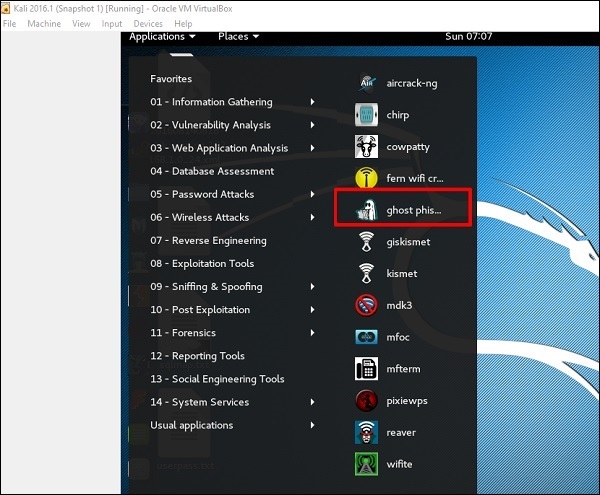 Ghost Phisher is a popular tool that helps to create fake wireless access points and then later to create Man-in-The-Middle-Attack. 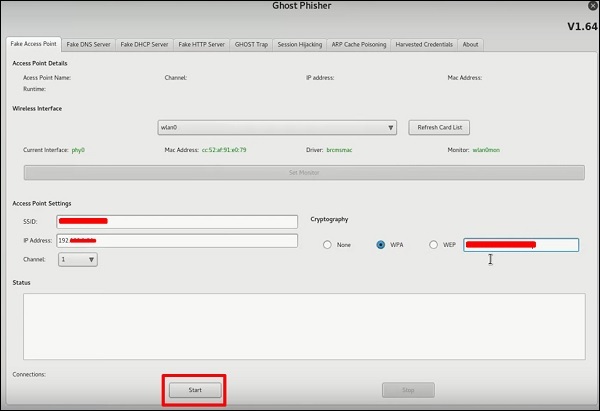 Step 1 − To open it, click Applications → Wireless Attacks → “ghost phishing”. Step 2 − After opening it, we will set up the fake AP using the following details. Step 3 − Click the Start button. 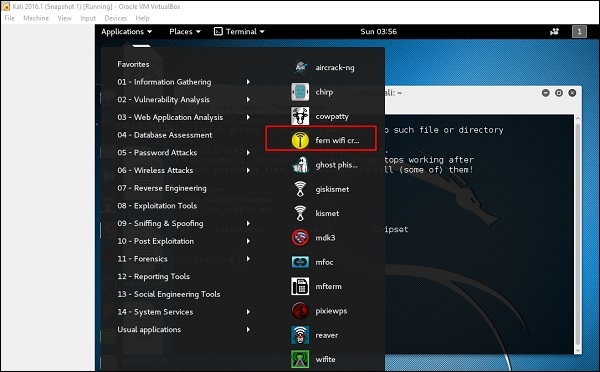 It is another wireless clacking tool, which attacks multiple WEP, WPA, and WPS encrypted networks in a row. Firstly, the wireless card has to be in the monitoring mode. 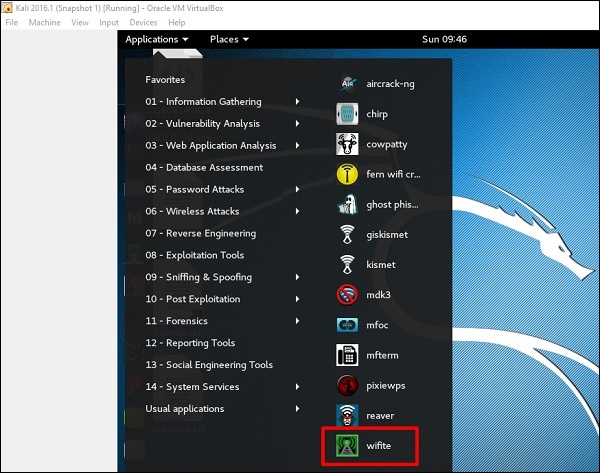 Step 1 − To open it, go to Applications → Wireless Attack → Wifite. Step 2 − Type "wifite –showb"to scan for the networks. Step 3 − To start attacking the wireless networks, click Ctrl + C.
Step 4 − Type “1” to crack the first wireless. Step 5 − After attacking is complete, the key will be found.